Web Services are an XML technology recently viewed as capable of being used for network management. A key aspect of WS in this domain is event reporting. WS-based research in this area has produced a collection of notification specifications, which consider even aspects such as filtering to reduce machine and network resource consumption. Still though, additional aspects need to be addressed if WS event reporting is to be used efficiently for network management. 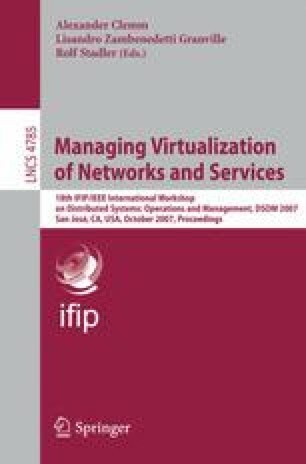 This paper borrows an idea in network management that of policy based task delegation and applies it in the context of WS-based management by using the WS-Notification standard messages, to increase event reporting efficiency. More specifically, we are adding functionality to the entity that produces events making it capable of performing a set of tasks apart from simple ones such as collecting and reporting notification data. This functionality allows an entity, such as a manager, capable of delegating tasks of various complexities to an event reporting entity where they can be performed dynamically. As a proof of concept that the approach is feasible and increases efficiency we analyze a complex event reporting scenario where task delegation is used. We compare this approach for performance to a plain WS-based event system and also to simple SNMP traps.